International expertise for the second phase – smoke extraction fans to be supplied by Talleres Zitrón S.A. Smoke extraction fans for the Matinkylä-Kivenlahti section will be supplied by Spanish manufacturer Talleres Zitrón S.A. The total contract price is EUR 1.8 million. Smoke extraction fans are used in the event of fire to exhaust smoke from underground areas through smoke zone routes to open air. Smoke extraction fans are installed on vertical shafts in the metro line and in the east and west ends of stations. The second-phase metro line and stations will have a total of 15 extraction fans. Talleres Zitrón also supplied a total of 32 extraction fans for the first phase of the West Metro from Ruoholahti to Matinkylä. Operation of the smoke extraction fans was tested on the first phase of the West Metro by means such as passenger rescue drills before metro service was begun. The 52 different systems of the West Metro guarantee passenger safety at all times, including emergencies. High-performance smoke extraction fans exhaust smoke quickly through the correct routes to ensure that passengers can be evacuated safely. In the West Metro, the movement of passengers between tunnels has been facilitated by, for example, constructing fire compartmented connecting tunnels in intervals of some 150 meters and by equipping both tunnels with prefabricated concrete units whose covers that serve as emergency exits. 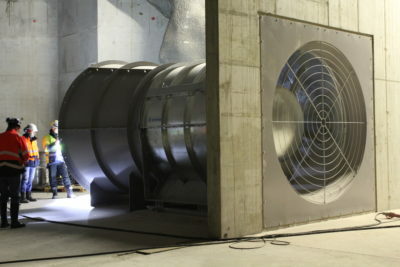 Talleres Zitrón supplies smoke extraction fans for demanding applications, such as the metro projects in London, Milan and Rome. The company has supplied extraction fans to some 100 metro systems around the world. The first smoke extraction fans will be delivered to Kivenlahti in the summer of 2019. The second phase of the West Metro is estimated to be completed in 2023. This year, work has progressed from excavation to construction. The project management contractors for all five stations and the rail line have been selected, and construction will begin at all stations by the end of the year. On the rail line, some 360 supporting wall elements have already been installed over a distance of 1.5 kilometres. The tendering of subcontracts will continue until summer 2019. At the Sammalvuori depot, work has already progressed to technical building services. Construction on the stations and rail line will continue until 2022, after which the project will proceed to the commissioning phase. This includes the acceptance of contracts, extensive testing and regulatory approvals. Länsimetro’s share of the project will be completed once the metro is handed over to the operator to begin preparations for passenger traffic.